So little dialogue…so much drawing…and I don’t like any of it. I’ve gotten slammed in the past for being too critical of my work. Whenever I get into that mode, people usually do one of two things: either 1) defend my work against me and my wonderful insecurities or 2) tell me that I’m being a complete artwad for even talking like this. As such, I had resolved to not be so critical of myself and stop trying to ruin others’ good fun with what I’m doing with SF. Examples of this would be the commentaries I’ve been working on for Chapter 5, which thus far do not contain quite as much venom as I had been spewing forth on Chapters 1-4. You can find each one of the characters represented above in the “Characters” section of this very site. But, for those that are curious, here’s the run down. 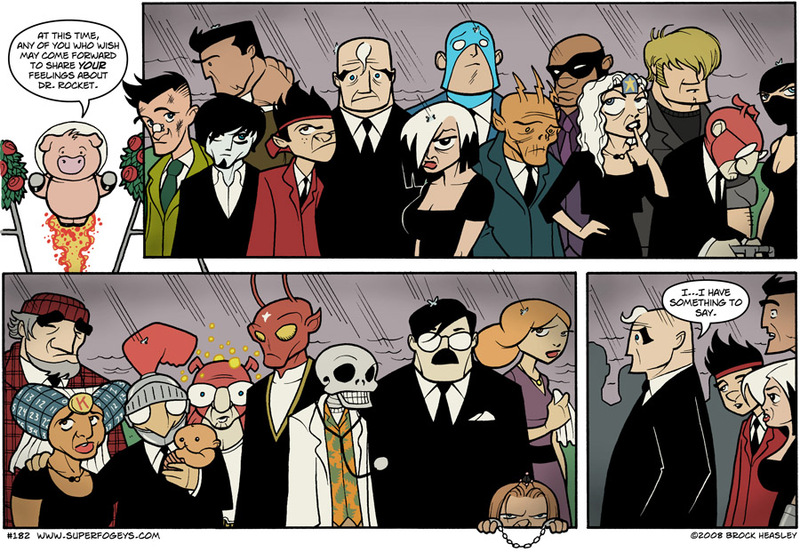 Panel 3 L-R: Lumbering Jack, Duchess of Keno, Bingo Knight, Baby Plinko, Bubbles of Light, Venusian Evilhunter, Death, M.D., Dr. Klein, Dictator Tot, Nurse Carter. As for the notable absences…don’t worry, they’ll be explained soon enough. Though I’m sure if you think about it you’ll know very quickly why they’re not there. Be sure and check out the SuperFogeys Store for the latest original art for sale. Right now, I have just two pencil pieces up, but more is coming! If there’s a strip in particular you’re interested in, please let me know and I’ll do my best to accomodate you. Don’t forget that SF T-Shirts and Books are available as well!